Tsunade has a frail and old appearance, more so even than her age would suggest. However, she maintains the appearance of her younger self through a constant Transformation Technique. Despite being known as flat-chested in her childhood, she now has rather sizeable breasts — 106 centimetres, according to Jiraiya. Her beauty has been pointed out several times and she's actually been called the most beautiful kunoichi in Konoha. She has a violet rhombus on her forehead, a chakra gathering point known as the Yin Seal. Tsunade has fair skin and brown eyes. Except for her bangs, which are parted in the middle and fall down the sides of her face, Tsunade's long, blonde hair is tied into two ponytails using bands in the same colour as the seal on her forehead. She often wears a grass-green robe with the kanji for gamble (賭, kake) written in black on the back, inside a red circle. Underneath she wears a grey, kimono-style blouse with no sleeves, held closed by a broad, dark bluish-grey obi that matches her trousers. Her blouse is closed quite low, revealing her sizeable cleavage. She wears open-toed sandals with low heels and nail polish in the same colour as her trousers and obi on both her fingernails and toenails. She also wears a soft pink lipstick. She used to wear the First Hokage's Necklace in clear view on her chest, before giving it to Naruto Uzumaki. Personality: Tsunade typically projects a tough demeanor, even when facing great personal difficulty, and rarely compliments or praises people. She readily criticizes others for their faults, such as Naruto for his immaturity, or Jiraiya for his perversion, though her habits are rarely any better. On occasion, though, Tsunade shows sympathy for others, consoling Shikamaru that, while he failed his mission to return Sasuke to Konoha, all of his team-mates survived. This is also shown when she worked hard in order to help heal Rock Lee, so that he might continue to be a ninja. She also allowed herself to cry when she learned of Jiraiya's death, though not in public. 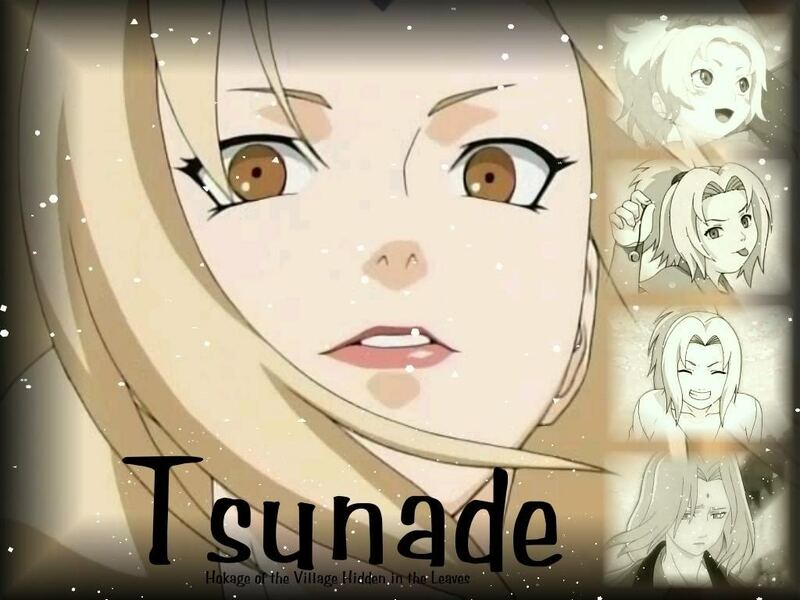 When first introduced, Tsunade is cynical of anyone with dreams, especially those who want to become Hokage. After meeting Naruto she realizes that this cynicism is insulting to the memories of Dan and Nawaki. She has a change of heart, puts her faith in Naruto, and takes on the mantle of Hokage herself, carrying on the dreams of Dan and Nawaki. As Hokage, Tsunade has shown the same level of loyalty to the village that previous Hokage held; during the invasion of Pain, she released all of her chakra in order to save the lives of hundreds of people within Konoha, at great personal risk. Tsunade also has a great deal of faith in the next generation, and sees the potential that Naruto and the rest of the Konoha 11 hold. Tsunade is also a compulsive gambler, who has the unfortunate disadvantage of having terrible luck. As a result, she has been elevated to a comical status as "The Legendary Sucker" (伝説のカモ, Densetsu no Kamo) because of the gross profits others have made off of her misfortune and gambling addiction. In the rare instances that Tsunade hits a winning streak, she believes it to be a bad omen, and bad things do tend to happen to her or her comrades afterwards. The symbol on the back of her coat, 賭 (kake), means "gamble", or "wager", as gambling is one of her favorite pastimes. In life-threatening or important situations that involve someone she cares in danger, she tends to anger against people who disagree with her plan, such as the restrictions the Konoha Elders put on Naruto, or the argument on whether Naruto or Killer Bee should participate in the Fourth Great Shinobi World War, even calling Gaara a "little punk" once disagreed by. When she caught Jiraiya peeping on her while she was in the hot springs, she proceeded to break both of his arms, six of his ribs and ruptured several internal organs as a punishment for being a pervert. Ever since then, Jiraiya has been very careful to suppress his perverted ways around Tsunade. Jiraiya mentions that this is one of the two times he has ever been close to death. Tsunade shuns all of Jiraiya's romantic advances throughout most of the storyline. While he is in Amegakure investigating Pain, she bets that he will die so that her terrible luck will ensure he survives. When she finds out he has died, she thinks back on their time together and cries for the loss of her good friend. Thus making her the last living member of Team Hiruzen and the Sannin. Tsunade took Shizune, her lover's niece, as an apprentice, and trusts her greatly. In fact, Shizune is one of the few people Tsunade trusts with absolute certainty. Tsunade also owns a pig, Tonton, as a pet, and leaves her to Shizune's care. After his failed invasion of Konoha, Orochimaru sought out Tsunade. Upon finding her, he asked her for a favor, though before he could specify what this favor was, she declined, having already noticed his wounded arms. Trying again, Orochimaru asked her to heal his arms, explaining that the injury was a result of his carelessness when killing the Third Hokage. Shocked by this revelation, Tsunade prepared to kill Orochimaru, though he once again intervened by offering to resurrect her dead loved ones: Dan and Nawaki. Interested in this offer, Tsunade considered it, and was left a week to decide. The three Sannin together again. Soon afterward, Tsunade was approached by Jiraiya and Naruto Uzumaki, who wanted her to become the next Hokage. After turning down the offer and ridiculing it, Naruto challenged Tsunade to a fight, enraged that someone could disrespect the title of Hokage. Tsunade accepted, and easily won, though not before witnessing Naruto's attempt at using the Rasengan. Intrigued, Tsunade made a bet with Naruto to master the jutsu in a week; if he won, he would get the First Hokage's necklace, and if Naruto did not master the Rasengan within a week, Tsunade would get all the money he was carrying. Naruto accepted the bet, and resumed his training. As the week progressed, Tsunade kept a careful eye on Naruto's progress, and all the while contemplated Orochimaru's offer. When the week was up, and Naruto appeared to have failed in mastering the jutsu, Tsunade went to meet Orochimaru, first drugging Jiraiya to make sure he didn't interfere. Upon meeting with Orochimaru, Tsunade asked that he not destroy Konoha when his arms were healed. Orochimaru agreed, and Tsunade prepared to heal him, though was interrupted by Orochimaru's assistant, Kabuto Yakushi. Kabuto, being a medical ninja himself, was able to notice the killing intent of Tsunade's healing jutsu, and as such, knew that she really intended to kill Orochimaru. Her motives known, Tsunade revealed that she knew Orochimaru had lied when saying he'd leave Konoha alone, and that she couldn't bring herself to allow it, due to Nawaki and Dan having loved Konoha until the end of their days. While she had tried to forget this fact over the years, Naruto's determination and desire to be Hokage reminded her of their dreams, and she had decided to do whatever was necessary to protect those dreams. With that, Tsunade attacked Orochimaru, though Kabuto fought her in his place. As the two traded blows, Kabuto began to realize that he was completely outmatched, and decided to use her fear of blood to his advantage, slitting his wrists to paralyze her. As Kabuto began to beat on Tsunade, Shizune and Naruto came to her rescue. While both were easily defeated, Naruto was able to overcome his injuries and continued to protect Tsunade. Although Tsunade told him to run, Naruto refused, and managed to hit Kabuto with a perfected Rasengan in his effort to protect her, defeating Kabuto. As Naruto collapsed, and was left near death due to Kabuto's last attack, Tsunade rushed to his aid and attempted to heal him, not willing to allow him to die. Her efforts were successful, and Naruto claimed the amulet he had now won before losing consciousness. Putting the necklace around his neck, Tsunade asked once more for its wearer to become Hokage. Tsunade with the Hokage Hat. Orochimaru, worrying about what kind of threat Naruto might become when he got older, tried to kill him, though Tsunade blocked that attack, using herself as a human shield. Orochimaru inquired as to why she was protecting Naruto, to which she replied that Naruto would someday be Hokage, and that she would not allow him to die before that happened. With that, Tsunade accepted the title of Fifth Hokage that she had been offered, and overcame her fear of blood, her first action being to eliminate Orochimaru. Joining forces with the still drugged Jiraiya, the two attacked Orochimaru. After a battle of summons, Tsunade dealt the finishing blow to Orochimaru. Defeated, Orochimaru escaped, vowing to destroy Konoha once he'd healed himself. Once Naruto recovered, the group returned to Konoha, Tsunade ready to take the role Dan and Nawaki so dearly desired, and secretly believing that Naruto would someday become a great Hokage. Soon after arriving in Konoha to take her place as Hokage, Tsunade healed the mental injuries inflicted by Itachi Uchiha's Tsukuyomi on Kakashi Hatake and Sasuke Uchiha. She also gave a grim prognosis on Rock Lee's condition. She stated that the only procedure that could allow him to return to duty as a ninja was one that she alone was capable of performing, and it only had a fifty per cent chance of success; if it didn't succeed then it would prove to be fatal for Lee. Not liking the odds of such a dangerous procedure, Tsunade advised Lee that it was best that he retire as a ninja and find another profession. In the anime, while Lee is struggling to decide what he should do, Tsunade looks into ways to improve his chance of survival. Thinking back to how she had seen Kabuto withstand Naruto's Rasengan, Tsunade used Kabuto's technique as an inspiration to expand on the life-threatening operation and improved Lee's chances of survival from fifty per cent to fifty-eight per cent. Lee finally agreed to undergo the procedure and survives. When Sasuke defected from the village so that he could go to Orochimaru, Tsunade was forced to send out a group of Genin to try and stop and retrieve him. She also used Konoha's reacquired alliance with Sunagakure to call in a favor for reinforcements, hoping to give the retrieval team some back-up. Despite her efforts, the group ultimately failed, and Tsunade helped in healing their fatal injuries, bringing them back to full health. In the aftermath of Sasuke's betrayal, Sakura Haruno asked to become Tsunade's apprentice, which Tsunade gladly accepted. Tsunade appeared in numerous filler arcs, though she typically did nothing more than sending others out on missions, occasionally trying new ways of deciding who would go on a specific mission. Her goal during the filler arcs was to keep Naruto busy until Jiraiya came back, to prevent him from going after Sasuke himself. When the Legendary Stupid Brothers escape from prison, she convinces them to surrender with a quick display of genjutsu and her strength. In another filler, she summoned Katsuyu to deal with some impersonators of Rock Lee and Might Guy, who had entered the village. After Naruto's return to Konoha after the timeskip, the village's elders questioned Tsunade's decision to allow Naruto to go out on missions when Akatsuki sought to capture him. As such, the elders forced Tsunade to allow one of the men of Danzō Shimura, a fierce opponent of the Third Hokage, to be teamed with Naruto. Not trusting Danzō, Tsunade assigned Yamato to lead Naruto, and to keep an eye on Danzō's addition to the team. Later, when two Akatsuki members entered the Land of Fire - namely Hidan and Kakuzu - Tsunade mobilized the Nijū Shōtai to look for and, if possible, capture the Akatsuki duo. While capture never came to be possible, the Akatsuki members were both defeated. Tsunade later performed an autopsy on Kakuzu, and found Naruto's newest jutsu, Wind Release: Rasenshuriken to be too dangerous for use, based on the damage done to Kakuzu's body and Naruto's arm. She explained that the attack had struck at a cellular level, causing extensive damage to the both of them, and regretfully told Kakashi and Yamato not to allow Naruto to use the jutsu again. In the anime, after finishing her autopsy on Kakuzu, Tsunade received a report from a deceased ANBU captain about Orochimaru and Sasuke's whereabouts. She called for Kakashi, and put him in charge of Team 8 to investigate. Because the mission involved a chance of finding Sasuke, Tsunade tried to keep Naruto from finding out about it. He found out anyway, so Tsunade didn't hesitate to send him as back-up. Later, Tsunade received news that Team Kakashi had encountered the Three-Tailed Giant Turtle. Deciding that they needed to capture the beast quickly, as to not let it fall into enemy hands, Tsunade ordered Tenten, Rock Lee, and Ino Yamanaka to aid Team Kakashi in sealing the beast. Before sending them out, Tsunade made a large and special scroll to aid the team in sealing the beast. She also decided to summon and send out Katsuyu for further assistance. When the forces they sent continued to have problems with the sealing, Tsunade called them back to Konoha, and sent some ANBU to replace them. After she heard about the ANBU losing contact with Konoha, and the disappearance of the Three-Tails, Tsunade suspected that Akatsuki were somehow involved. In the anime, word reaches Konoha that the Tsuchigumo clan's fort protecting a powerful forbidden jutsu was under attack. With Team Kakashi and Team Kurenai being the closest, Tsunade sent Katsuyu to inform them of their mission to aid the Tsuchigumo clan, in accordance with the peace treaty the Third Hokage made with them. Tsunade later receives word from the teams that they and the clan have considered destroying the jutsu to end the possible danger it can cause. Tsunade healing multiple people in Konoha with her chakra. When word reaches Konoha of Jiraiya's death, Tsunade makes the village's top priority analyzing the clues Jiraiya left behind about Pain's identity. While the likes of Shizune, Ibiki, and Shikamaru are hard at work, Tsunade allows herself and opportunity to cry for her old friend. Naruto, just as badly affected by Jiraiya's death as Tsunade, went away to train, both of them knowing that he was Pain's next target. When the invasion of Pain began, Tsunade tried to send word for Naruto to return home. She was stopped by the Konoha Council, who feared his capture by Akatsuki. However, Tsunade insisted that they must have faith in Naruto, along with the rest of the next generation, and so they relented. Tsunade began issuing orders for the village's defense, placing extra protection around those still working on Pain's secret. She summoned Katsuyu, and had her divide and seek out every villager so that she could protect and heal them remotely. While sitting in the middle of a seal guarded by ANBU, transferring her chakra to Katsuyu, she was found by Pain's Deva Path, whom she recognized as one of the orphans Jiraiya trained in the past. Tsunade refused to tell it where Naruto was, proclaiming that Akatsuki was just a terrorist group. When Pain discovered Naruto's location through other means, the Deva Path resolved to make Tsunade see what Akatsuki's true goals were. Tsunade in her weakened state. The Deva Path destroys the village. In the few moments between when the destruction began and ended, Tsunade poured all her chakra into Katsuyu in order to keep the inhabitants safe. In the aftermath, she confronted Pain, who attempted to kill her with his Asura Path. It was stopped by Naruto, who informed Tsunade that he would personally deal with Pain. Having used up almost all of her chakra, Tsunade's elderly form resurfaced, she then falls into a coma and does not see Naruto's defeat of Pain. While Tsunade recovered, Danzō was chosen to replace her as the Sixth Hokage. He was killed by the now-international criminal Sasuke Uchiha after the Kage Summit and the village prepared to make Kakashi Hokage, but Tsunade woke up before the appointment could be finalized. Tsunade learned of everything that happened while she was in her coma; the start of the Fourth Great Shinobi World War, the Shinobi Alliance, and the identity of Tobi. After replenishing her chakra levels, she convened a war council to prepare the village for the coming conflicts. Three days later, she traveled to Kumogakure with Shikaku Nara as her bodyguard to attend an Alliance meeting with the rest of the Kage. Upon having her health and position questioned due to her age by the Third Tsuchikage, she retorts saying that she had had enough of his double standards. On the other hand, she learned that the Fifth Mizukage was reassured by her return. Tsunade proceeds to inform the Alliance that her people are investigating a possible enemy base, but since the possibility of it being a trap remains, they will have to do more intelligence-gathering. Moments later, when Ōnoki brings up the matter of hiding the jinchūriki, Tsunade becomes infuriated, claiming that Naruto Uzumaki and Killer Bee were major assets to their combat strength, and that hiding them away was preposterous. Although she does not underestimate Akatsuki's strength, she is prompt to say that if they don't strike hard with their full powers, they might not get a second shot at victory. Ōnoki explained to her that putting them in the front lines would be dangerous, as they are the enemy's target in the war. Also the Fifth Kazekage reminded her that it wasn't up to her to make decisions unilaterally. Gaara proceeds to speak about Naruto and his tendency to do absurd things for the sake of his comrades, which was certainly the main problem. She agrees in the end and the jinchūriki are hidden away. Afterwards Ōnoki complimented the "impudent Slug Princess" for her energetic testimony. Roleplay Sample: It had been a long day for Yuki, One of those days were you just wanted it to end but it would not. It was her turn to patrol the backstreets of Kaioyugakure, she did not mind she loved working in the backstreets she got to meet some interesting people. Walking she looked at the people they all looked as if they were plotting something, chuckling to herself she shrugged them off. Sighing deeply Yuki walked past a dango shop and walked in feeling a bit thirsty, seeing a seat near a wall she sat in it and kicked her feet on the table. Wearing her usual attire of black short shorts, a black bra with red flames and a pair of wait and red boots she waited for someone to come over to take her order. Her gold eyes wandered over the place and she shook her head in disgust as she seen the acts that went on before her, Letting her fire red hair down from it's ponytail she sighed deeply and called a waitress over because she was tired of waiting.